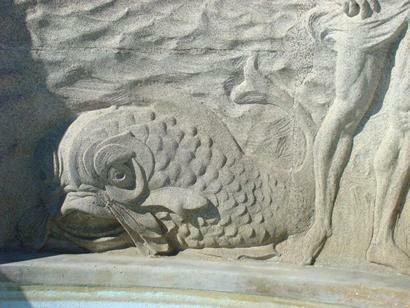 Queen of the Sea by Pompeo Coppini, Corpus Christi, Texas. 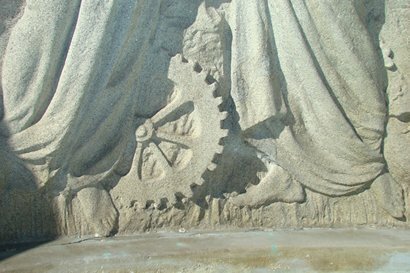 It is hard to recognize this fountain for being a memorial to the Confederacy, however, that is what it is. 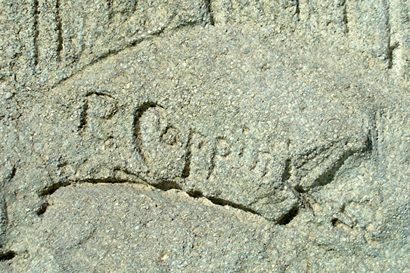 Funding was provided by the Daughters of the Confederacy, Corpus Christi Chapter with additional funds being donated from the two newspapers that were published in Corpus Christi at that time. 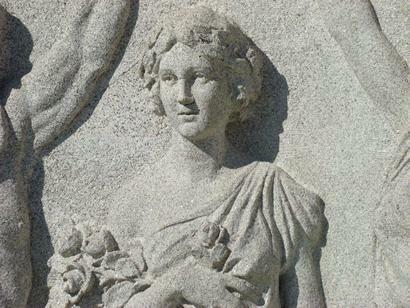 King Neptune and Mother Earth hold a crown above an allegorical female (representing the city of Corpus Christi), who carries a bouquet of flowers and the keys of success. Nary a soldier is to be seen. 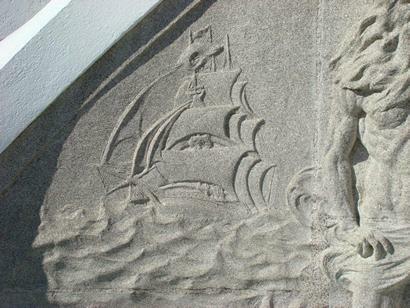 A ship under full sail is carved behind Neptune, while a plowman tills the soil behind Mother Earth. 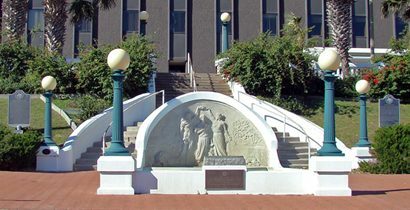 The Texas historical marker text tells the story of the bluff development of which the fountain is a part. 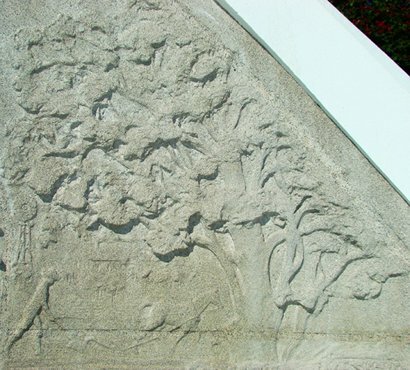 The work was restored in 1990 as a project of the Corpus Christi Rotary Club. 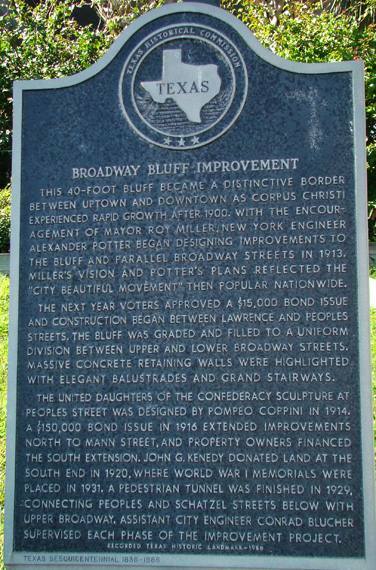 This 40-foot bluff became a distinctive border between uptown and downtown as Corpus Christi experienced rapid growth after 1900. With the encouragement of Mayor Roy Miller, New York engineer Alexander Potter began designing improvements to the Bluff and parallel Broadway streets in 1913. 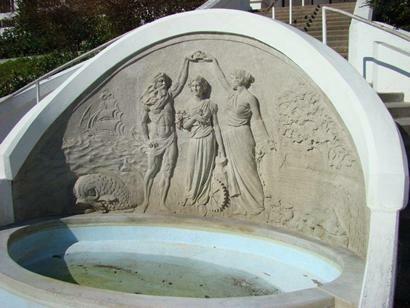 Miller's vision and Potter's plans reflected the "City Beautiful Movement" then popular nationwide. The next year voters approved a $15,000 bond issue and construction began between Lawrence and Peoples Streets. The bluff was graded and filled to a uniform division between upper and lower Broadway streets. Massive concrete retaining walls were highlighted with elegant balustrades and grand stairways. 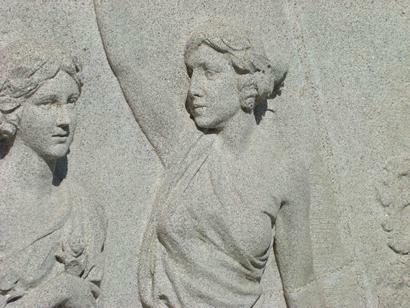 The united daughters of the confederacy sculpture at Peoples Street was designed by Pompeo Coppini in 1914. A $150,000 bond issue in 1916 extended improvements north to Mann Street, and property owners financed the south extension. 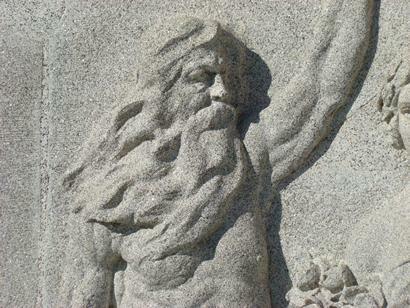 John G. Kenedy donated land at the south end in 1920, where World War I memorials were placed in 1931. A pedestrian tunnel was finished in 1929, connecting peoples and Schatzel Streets below with upper broadway. Assistant city engineer Conrad Blucher supervised each phase of the improvement project. Henry L. Kinney (b. 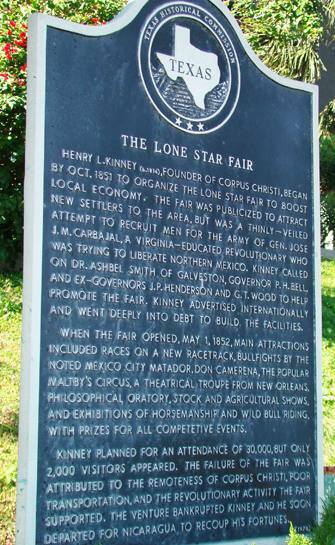 1814), founder of Corpus Christi, began by October 1851 to organize the Lone Star Fair to boost local economy. The fair was publicized to attract new settlers to the area, but was a thinly-veiled attempt to recruit men for the army of Gen. Jose J.M. Carbajal, a Virginia-educated revolutionary who was trying to liberate northern Mexico. Kinney called on Dr. Ashbel Smith of Galveston, Governor P.H. Bell, and ex-governors J.P. Henderson and G.T. Wood to help promote the fair. Kinney advertised internationally and went deeply into debt to build the facilities. When the fair opened, May 1, 1852, main attractions included races on a new racetrack, bullfights by the noted Mexico City Matador, Don Camarena, the popular Maltby's Circus, a theatrical troupe from New Orleans, philosophical oratory, stock and agricultural shows, and exhibitions of horsemanship and wild bull riding, with prizes for all competitive events. Kinney planned for an attendance of 30,000, but only 2,000 visitors appeared. The failure of the fair was attributed to the remoteness of Corpus Christi, poor transportation, and the revolutionary activity the fair supported. The venture bankrupted Kinney and he soon departed for Nicaragua to recoup his fortunes.